Indonesia's GDP has fallen short of its growth target of 6.3%, which was estimated this year in the budget. In the third quarter of the year, the country posted a growth of 5.6%, dropping from the 6.11% GDP recorded over the same period a year ago. This is reportedly the weakest quarterly growth since 2009, at the height of the financial crisis hitting the country's economy, according to Statistics Indonesia. But despite this, Indonesia still remains an attractive market in the region. Typical of an emerging economy, the country has a huge population of nearly 250 million and is ranked the 4th most populous country globally, not to mention that it has a sizeable affluent middle class population. The Boston Consulting Group (BCG) forecast early this year that Indonesia's middle income and affluent classes will double by 2020 from the current 74 million to 141 million. By then, slightly more than half of the population will be categorised as affluent. This translates to a potentially large market for plastics, either now and in the near term. Moreover, the government, to meet this growing demand for the material, has initiated that 70% of plastics products must be produced locally, thus consequently spurring the demand for advanced technology for better and increased production. All prospects will be looking up for Indonesia in time, according to a report by McKinsey Global Institute. It projected that the country will become the world's 7th largest economy by 2030, claiming an edge over the likes of countries like Germany and the UK. By 2030, some 90 million consumers will be fuelling the country's economy, ranking it amongst the top world economies. Growth in the country's plastics industry transpires from the demand in the packaging sector, particularly for the food and beverage segment. Indonesia's plastics consumption in 2011 was 2.8 million tonnes and went up to 3 million tonnes in 2012. Almost 70% of the total plastics use was accounted for by the food and beverage packaging sectors. According to the Indonesian Packaging Association, more than half the demand is made up of plastic flexible/rigid packaging, driven by increased packaging requirements from the domestic food, beverage and pharmaceutical industries. Last year, a statement from the Office of the Chief Economist, which was published by the country's Bank Mandiri, indicated that plastics is considered as a key material given its advantages of light weight, practicality, durability and resistance to certain substances. The challenge however is the emergence of green materials, which it says is being campaigned "more intensely". This may not immediately have an untoward effect on the demand for raw materials but manufacturers are already arming themselves by developing more environmental friendly plastic materials and likewise utilising the necessary technologies for it, according to the source. Another challenge faced by the industry is the upcoming formation of the ASEAN Economic Community (AEC) by 2015. As in other ASEAN states, readiness of some of the industry segments is a concern. Recently, the Indonesian Downstream Plastics Producers Association (Aphindo) urged the government to hone the competitiveness of the downstream industry by ensuring that raw materials are available in sufficient supplies locally as this will lower the cost for manufacturers. Currently, the downstream industry imports most of its raw materials. According to the group's Chairperson, Tjokro Gunawan, ample support for the development of the upstream plastics industry is needed, such as provision of appropriate fiscal incentives, to help them overcome the challenges of high import costs (for some components of end products). The group also recommended for the removal of import duties on upstream products that could not be produced domestically to increase production-cost efficiency. Indonesia levies up to 10% import duties on non-ASEAN states, and only 5% on ASEAN states. The recent Plastics and Rubber (P&R) Indonesia, which was simultaneously held with Propak Indonesia, from 20-23 November in Jakarta, solicited a positive sentiment for the home grown industry. According to G. Firmansjah, Chairperson of PT Pamerindo, the event's organiser, Indonesia is teeming with investment opportunities. He also said that foreign direct investments (FDIs) are likely to amount to 67 trillion rupiah this year. Against this background, about 11 international group pavilions from China, France, Germany, Italy, Korea, Singapore, Taiwan and Turkey were set up on the 21,600 sq m floor space, with 700 exhibitor firms from 38 countries. 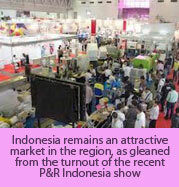 Many of the exhibitors have established sales and distribution networks in Indonesia. 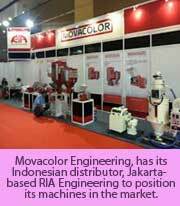 Dutch auxiliary equipment specialist, Movacolor Engineering, has its Indonesian distributor, Jakarta-based RIA Engineering, to position its machines in the market. Anders Olsson, Sales Director Asia Pacific, appraised the event positively as it generated a number of sales leads for the company during the four days. Hermann Ultraschall, a German manufacturer of ultrasonic welding machines, generators and sonotrodes, was a first time exhibitor. A spokesperson said that the company intends to push its machines in the Southeast Asian market. German machinery supplier Kiefel Technologies, which also has a sales and service centre in Indonesia, noted that the outcome of the events from the previous year to this year has been consistent. 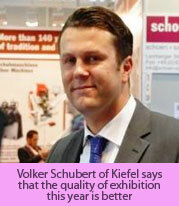 "Nevertheless, the quality of exhibition this year is better, " said Volker Schubert, Area Sales Manager, Packaging Industry. Dutch thermoplastics compounding specialist Resin Products & Technology was also a first time exhibitor at the event. Project Manager Nick van Hussen regarded the show as fair but expected more participants. The company is expanding to Indonesia and will start up a production facility in Jakarta by 2014. Sales Manager Rimon Novianto Hernawan from Italian compression moulding machine maker Sacmi's Indonesian sales office said that it's the plastic packaging and beverage closures market that is capping the local industry. Meanwhile Swiss thermoforming machinery maker WM Wrapping Machinery displayed its INTEC series on this year's show. A spokesperson also said that a majority of local manufacturers buy European machines for efficiency, stability and quality of production. Just like WM Wrapping, another thermoforming machine manufacturer Gabler is a frequent exhibitor at the show. South Korean LS Mtron, another frequent exhibitor at the show, displayed its LGE series machines that are used to produce electronic/electrical and automotive parts, amongst other applications. Speaking for the company, Sales Manager Chris Song surmised that the Indonesian market is "developing fast and it is highly likeable that Indonesia would have become Asia's biggest market in ten years time," he said. Japanese/German injection moulding machine maker Sumitomo Heavy Industries (SHI) is also witnessing the burgeoning demand for high quality machines, especially for the food and beverage sector, according to its Indonesian sales representative Zulkarnain.